I think Mushrooms are mad underrated; I don’t mean they don’t get recognized for being delicious – they do. I just think that they aren’t given their proper due. That’s not to say that I think we should organize a parade or fly a banner over Rockaway Beach. (We’ll save that for avocado day). I just think that they need to be appreciated more; like the girl who doesn’t get asked to dance at Homecoming. Grab that hand and proceed to Grind – Bobby Brown just came on! It is with this squarely in mind that I bring you today’s recipe. (I’m listening to Bobby Brown as I write this) Now, it doesn’t really hark back to a specific traditional recipe, rather, it culls various flavors and stacks them together. It’s somewhere between a Cazuela (casserole) and a Guisado (stewed) type of taco filling. The mushrooms are sweated alongside onions and fresh poblanos, browned and then braised with broth & cilantro. Read: All the makings of a delicious taco filling. From there, I served it on homemade corn tortillas (my recipe HERE) – obviously store bought are fine, just double up the tortillas – topped with Guacamole (My recipe HERE) and a simple cabbage slaw (Recipe follows) – all very basic and not overdone with toppings – how I like my tacos. 1. Dice your onions and (seeded) Poblanos. If you can’t find poblanos feel free to use a Green Bell Pepper. 3. Heat your oil in a large saute pan over medium high heat – add your onions and poblanos. 4. 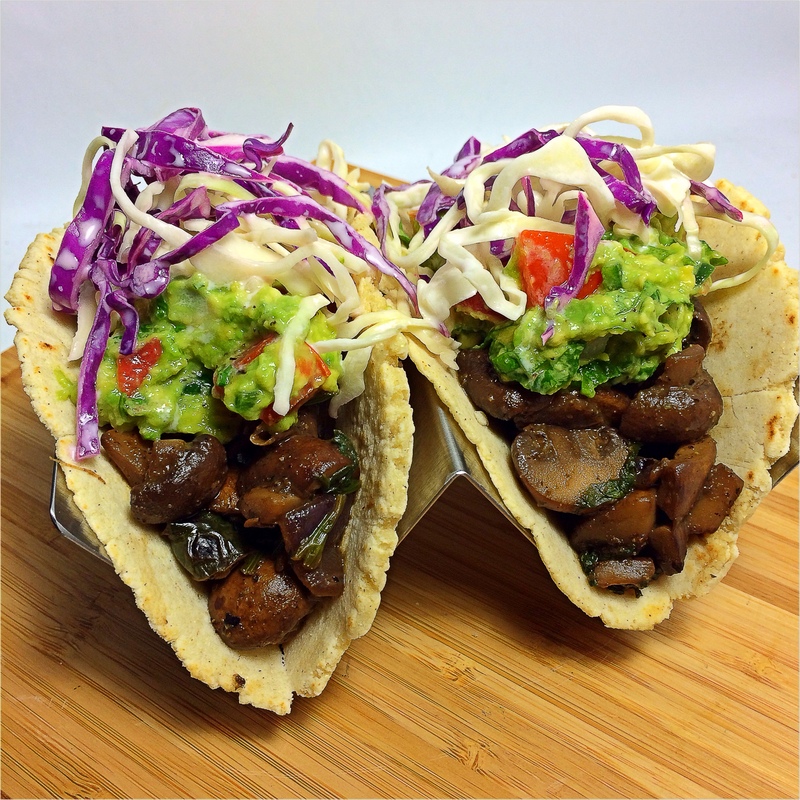 Cook for 3 minutes – turn the heat up to high and add your quartered mushrooms. Stir to incorporate the ingredients. 5. Cook for 3 minutes (stirring intermittently) – lower heat back down to medium high. 6. 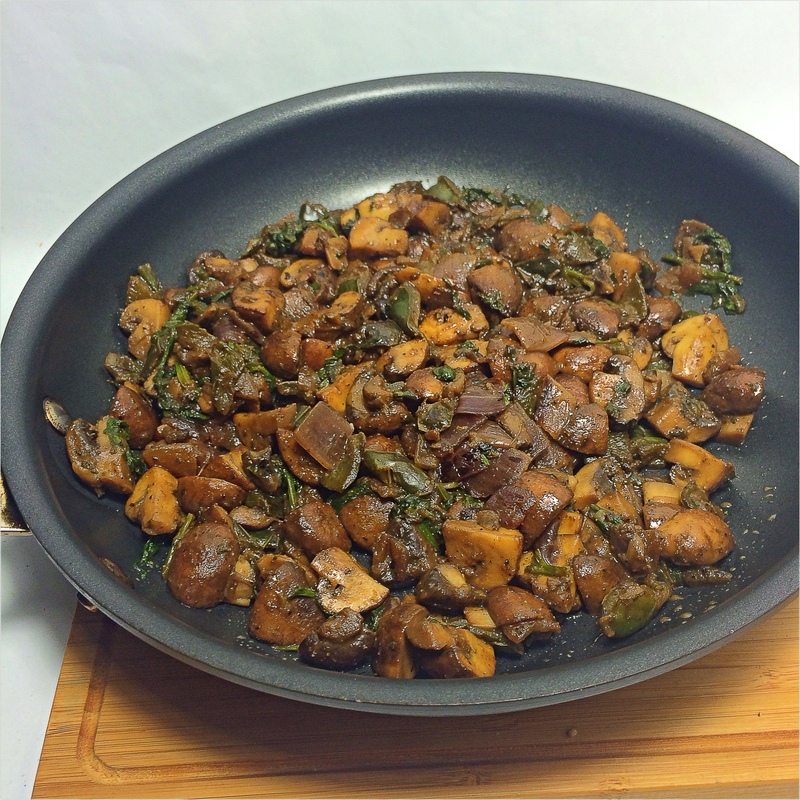 Cook Mushrooms until all of their liquid has been released (7 – 10 minutes) and have sufficiently browned. 7. Add your your cilantro, jalapeno, soy butter and then your braising liquid. 8. Lower heat to low and cook your filling until most of the liquid has cooked off. 1. In a medium bowl add your cabbage, cover in lemon juice, vegenaise and nutritional yeast. 2. Using a spoon or fork lightly toss all of the ingredients to incorporate evenly. 3. Salt & Pepper to taste. 3..Cover each taco with couple TBS of slaw. Then Eat! But Please be kind and share with Bobby Brown! These tacos are fantastic!!! I wanted to thank your for sharing the recipe. Youre so welcome! Thanks for making the recipe! I’ve been lusting over the food pictures you post on Instagram but finally realized yesterday you have a blog! Tried this today and wow!! So amazing. Thank you for sharing. I cook Mexican and Caribbean food often, but it’s missing an authentic touch. This was a helpful learning experience. I live in San Diego, but someday hope to try your cooking during a trip to NYC.